Bite into a Crispin for a great crunch and mouthful of sweet juice. The original name for this exceptional apple was Mutsu, reflecting its Japanese heritage. It was renamed Crispin in the late 1960s and has been gaining fans ever since. Sweet, refreshing and super crisp, these apples are excellent for eating, baking, freezing, or cooking into sauce. They are also good for salads and pies. Available almost year round. Try Crispins for roasting whole apples or thick slices. They're a wonderful accompaniment for your favorite roast. Paula Red apples are harvested in late October. 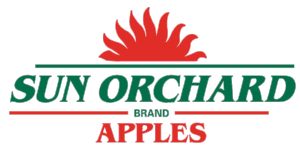 You can find Sun Orchard's Crispin in retailers November through August.